For Women in their 20s, 30’s, 40’s, 50’s…. Awaken to the Magic and Mystery of Living in a Woman’s body! This week-end retreat has had various titles: “Womens Mysteries Retreat,” “Blood Mysteries Retreat,” a “Maiden Ritual” and the “Women’s Rite for Healing and Empowerment.” All of these titles together start to paint the picture but no words can capture the full truth of this opportunity to come into your body and the energy of the Divine Feminine in a joyous and enlivening way! We sit in sacred circle, journey into our past and inner landscape, share from the heart about our woman’s journey, dance, sing, share food, tears and laughter. The culmination of the week-end is a ceremony that honors and welcomes each woman to womanhood. It is a POWERFUL week-end that will help support you to release negative experiences and internal scripts about your body, and open you to new pride and empowerment as a woman. 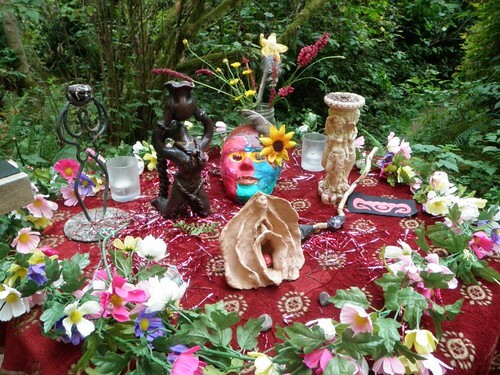 This retreat is the heart of the Sacred Groves Women’s Mysteries School. 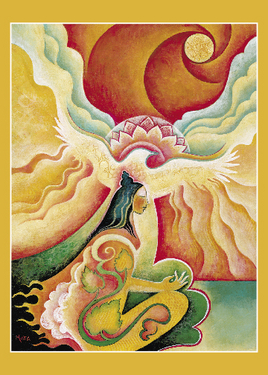 Through it, you will deepen your connection with your body and your spiritual power as a vessel of the Divine Feminine. You will understand and honor your personal journey as a woman in a new way. You will learn about the sacredness of your monthly cycles and your “MoonTime.” This ceremony has healing power at any point in life–early adulthood, mid-life and even for those approaching menopause. Many of us who did not experience this kind of thing in adolescence find that this retreat marks a turning point, after which you feel a new sense of beauty, love, and acceptance in your body. Suggested donation for the week-end is $175-250 which includes meals and lodging at the Groves (if needed). Discounts available upon request. For more information contact Therese. “It’s been difficult to explain my transformation or even our experiences over the weekend. Right now, I’d almost prefer to keep them close in my heart, rather than try to find words to convey the profound effect this experience had on me. The sisterhood, the sharing, the beautiful surrounds and the generous hospitality are all more than I could have dreamed. I think of each of you fondly and can remember pieces of your stories that impacted my heart. I left Sacred Groves feeling like a stronger, clearer version of myself. More authentic. I feel like the healing has finally begun, and you all played a part. I drove home singing songs we sang at the top of my lungs, much like a child after summer camp. With each verse, I felt my heart open and strengthen. I look forward to the future, but am working on enjoying the present and BEING present. You taught me how to let go, how to share openly, how to forgive myself and how to lean on my ancestors. I never knew how strong this would make me feel. I am forever indebted. Rise with the fire of FREEDOM…!